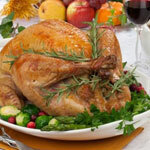 Digestion : Indulging in Holiday Parties? Soon the summer veggies and fruits will start to disappear from our plates and be replaced by heavier more celebratory meals. As the weather gets colder and holidays arrive we will most likely be satiated by richer foods and drinks and plenty of desserts. During times of celebration, it is not unusual to feel the digestive discomfort from one too many servings of your favorite food. There are ways to prevent over indulging in the wrong kinds of foods this holiday season. First, be sure to drink plenty of water before you host or attend your next seasonal gathering. You may also have a small protein rich meal or snack an hour before the party begins to curb your appetite. Next, keep moving! Do not get stuck at the table or on the couch for too long visiting. When we are distracted by good conversation we tend to accept foods that are passed around more readily. Nervous habits tend to culminate in snacking when in an environment filled with people you may not see often. So, choose slimming and filling foods from the appetizer trays. Things like celery, cucumbers, cauliflower, peppers and a fat free dip will go a long way with just a few light crackers and low fat cheese on your plate. Stay away from fried foods and if you must just take the smallest portion – do not eat the skin and chew slowly so that you are comfortable with just one piece – accompanied by some vegetable. When it comes to drinks – stick with non-alcoholic for most of the party. Or nurse your alcoholic drink and dilute it with sparkling water or tonic and load it with ice. Remember if you are driving to stop drinking hours before you get in the car. Light beers may seem like the best choice – but sometimes there is the thought that you can have more because they are light. One heavier, richer brew goes down more slowly and accompanies food well with a fuller feeling. For those of that like sodas – try this trick. Pour a glass ½ full of your favorite soda at a party and fill the rest with sparkling water or tonic. Try making a “light” gingerale, or a light cola – it works well and is satisfying with ½ the calories. I personally think that the diet sodas on the market are filled with sweeteners that are not healthful. So get as close to nature as possible. You can make a really good gingerale yourself for instance by taking fresh ginger and mashing it or grinding it and then add to that some wonderful Xylitol which is a sweetener low on the glycemic index. Stevia can work as well but has somewhat of an after taste. Chew slowly…and chew long enough to begin digestive processes in the mouth. Next think about portion control. Use a smaller plate and fill most of it with LIVE foods – that means veggies and fruits. If you want to keep your weight down this holiday season start an exercise program now. Walk, play a sport, get to the gym and do some weight training, use stretch bands…whatever you enjoy including dancing and yoga and other activities. Keep your metabolism higher by building muscle. If you do overindulge this holiday season and feel a bit of discomfort you can opt for a natural acid reliever and digestive aid. Try the latest in convenient and effective products on the market…AbsorbAid® a comprehensive digestive aid – it helps to alleviate occasional indigestion, sour stomach, heartburn, gas and bloating AND it contains powerful enzymes to help break down the food you have just eaten!! Make wise choices this holiday season – use AbsorbAid® for times when you overindulge! !